After about 7 hours of sleeping and waking up in body-aching positions, we arrived Buea from Bamenda at 5:15am, and our final destination at about 6:30am. It was when we wanted to charge our phones at the park in Buea that we realized that most of their sockets here only have two round holes, which was only favourable to my laptop charger. Our final destination is the home of a former Confluence Queens player's brother and we were served Pancakes and tea for breakfast on arrival before I finished up day two of my diary. Then I hit the bed to have the proper sleep that had eluded me for about 24 hours, after which we got ready for the Limbe Ominisport Stadium. Fufu and a really tasty Eru soup was what we had for lunch. Jessica, who is lodged in a hotel in Limbe, had visited the Super Falcons at their Parliamentarian hotel in Buea earlier, so we (Faith, Sam, Moses, Carine (the former Confluence Queens player and I) met up with her at Mile 17 before we all embarked on the One-hour trip to the stadium in Limbe (with traffic, you spend more time on the road). The first cab we entered stopped us at Mile 4, then the next one took us straight to the stadium - since we were all going there. But seriously, this country is expensive, spending CFA 2000 altogether, to and from Buea, with "I beg". 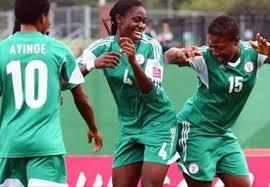 And Buea is where the hotel of the Super Falcons is located. Their routine training also takes place at a training pitch nearby, which is still not so nearby. Anyway, we were at the stadium, but not on time as we had planned. The pre-match press conference had already ended and the team was already training, so we set out to get our accreditation cards. The accreditation centre was at the stadium. There was a small crowd in front of the door, everyone (media, volunteers and so on) struggling to gain entrance. Somehow, Sam found himself in front, and told them about some Nigerian journalists here for their accreditation. After a while, we were called into the office, but before then we watched the Super Falcons players and officials stroll out of the stadium and into their bus. Mali had arrived to train next. And Nigeria had to exit the stadium, before they climbed down from their bus. Back at the accreditation office, I was the first to seat. Then the guy, who was to take my details, began to speak French, it was then I remembered Jessica studied French in the University. Her bits and pieces of French came in handy and she became the guy's friend instantly. My own French will not take me anywhere in this country. I can only greet and introduce myself in the language. Well, Sam was the only one that succeeded in getting his accreditation tag. Jessica, Faith and I had issues to sort out. Three of us tried to apply before the closing date, but could not, for one reason or another. So we eventually met Monsieur Koffi, who is in charge of CAF media, and explained ourselves to him. He took our emails but did not guarantee us anything. According to him we might not watch Nigeria's first game unless we buy tickets. We were still hopeful of getting confirmation letters in our emails, nonetheless, even when someone almost put sand in our garri.